How much light can my spectrometer capture? 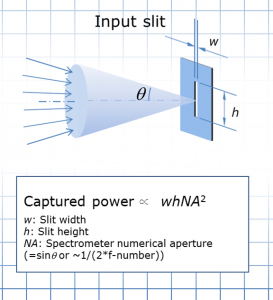 This technical note gives some very basic formulas for calculating the relative amount of light that a spectrometer can capture through a slit, fiber, and fiber bundle. As an example, you can use these simple formulas to compare different spectrometer solutions. The general situation for any surface with an area A where all positions on the surface accept light within a cone of top angle θ is illustrated in Figure 1 below. 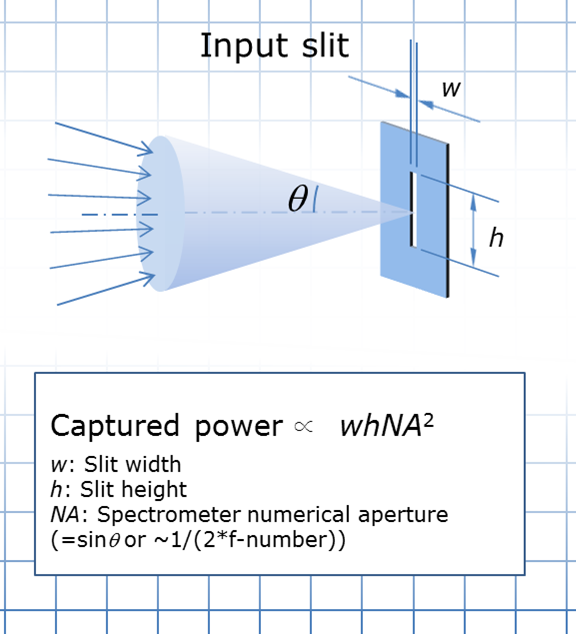 The amount of light your spectrometer can capture is in general determined by the input slit area and the f-number of your spectrometer. 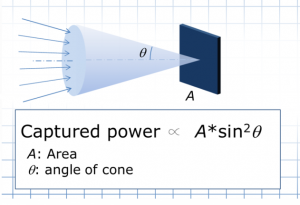 The f-number is related to the top angle θ of the cone of light that the spectrometer can accept. The f-number is also related to the numerical aperture of the spectrometer. See Figure 2. If your spectrometer is collecting light through an optical fiber it will be the core area and numerical aperture of the fiber that determines how much light can be collected as shown on Figure 3. However, the light captured by the fiber may be further reduced if the spectrometer uses a slit with an area smaller than the fiber core area. Also, if the spectrometer numerical aperture is smaller than the fiber numerical aperture, you should use the spectrometer numerical aperture in the estimation of light captured. Finally, you should be aware that a typical multi-mode fiber will decrease your throughput by ~50% due to the reflection loss at the two end faces as well as the propagation loss through the fiber. The slit of a spectrometer will typically be rectangular shaped with a one dimension much longer than the other. 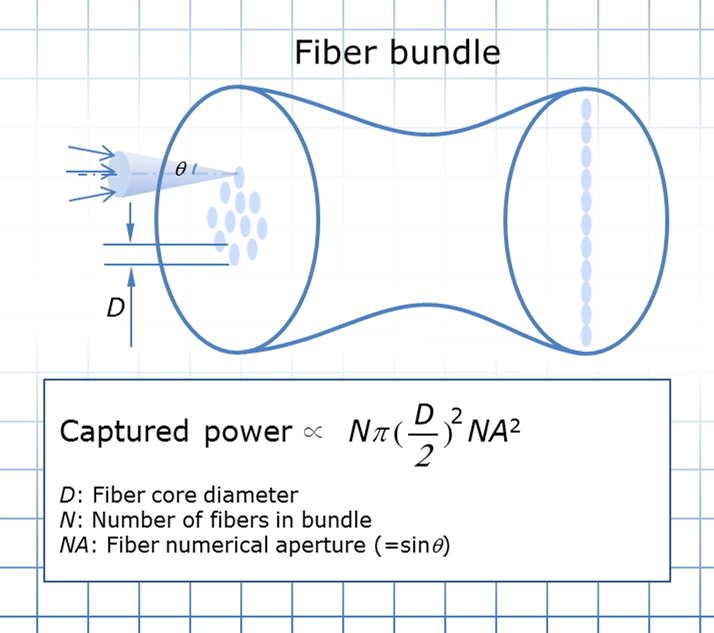 A fiber bundle can be used to collect light from a circular area and convert it into a rectangular area matching the slit area as shown on Figure 4. 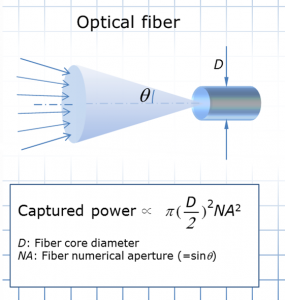 The light capture by each individual fiber is the same as in Figure 3, but since we now have N fibers the amount of light captured is also N-times larger. 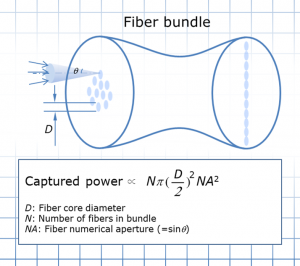 Just as the case for the single multi-mode, the fiber bundle will also cause a ~50% power loss.